Hoyle, Tanner is pleased to announce the firm’s consulting engineering services on the rehabilitation of the Beaverkill Covered Bridge have been recognized with the Platinum Engineering Excellence Award from the American Council of Engineering Companies (ACEC) New York. The project also received the 2017 New York State Historic Preservation Award by the New York State Office of Parks, Recreation and Historic Preservation. Hoyle, Tanner partnered with Erdman Anthony of Rochester, New York and completed the design for the rehabilitation of the covered bridge structure. The goals of the project were to rehabilitate the Rockland bridge and re-open it to vehicular traffic, while maintaining and preserving the historic fabric of the bridge. The full rehabilitation was successfully completed in June 2017 with the support of the Friends of Beaverkill Community, the Open Space Institute, regional preservation organizations and State agencies. The Beaverkill Covered Timber Bridge is a well preserved surviving example of Town’s Lattice Truss. This type of truss was patented on January 28, 1820 by Ithiel Town, a prominent American Architect and Civil Engineer. Town’s Lattice Trusses consist of diagonal timber planks that overlap and are connected with wooden pins or trunnels. The Beaverkill Covered Bridge truss varied from the one patented by Ithiel Town as it included splayed diagonal timber planks in a fanlike manner at each end of the bridge to provide additional stability. The bridge was originally built in 1865 by local builder, John Davidson, a Scottish immigrant who built two other covered bridges for the Town of Rockland. At the time of its construction, it was one of the first bridges to cover a largely unsettled region of the Catskill Mountain range, and today it is one of a few covered bridges remaining of the more than 300 that once existed in New York State. Due to its historic significance to the surrounding area, the bridge was listed on the New York State and National Register of Historic Places in 2007 and is an integral part of the Beaverkill Campground, one of the State’s oldest campgrounds. The design of the rehabilitation was managed by Sean James, PE. Sean has worked at Hoyle, Tanner since 1996 growing his expertise on bridge design projects. 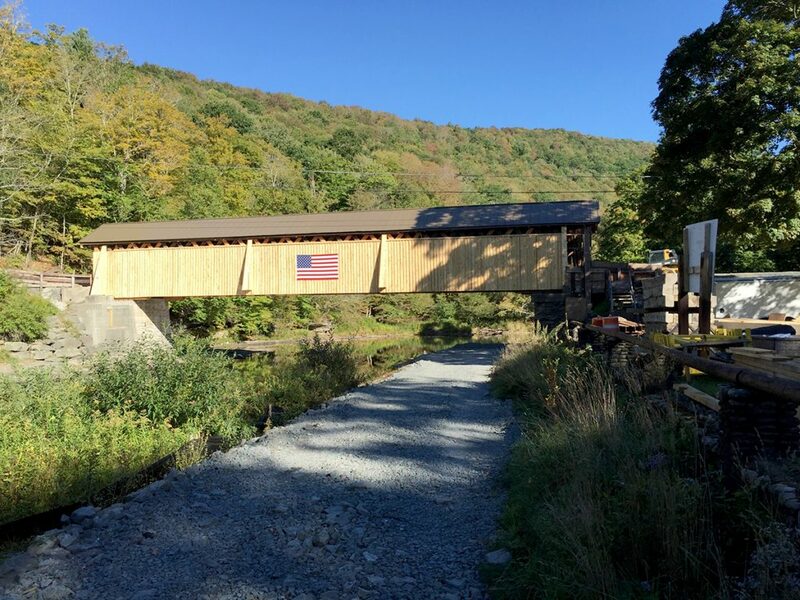 He has managed the rehabilitation of over 35 covered bridges in New England and New York and is a registered Professional Engineer in Maine, New Hampshire, New York, Vermont, and Pennsylvania. Josif Bicja, PE assisted Sean as the Senior Structural Engineer responsible for the in-depth inspection, structural design, load rating, cost estimates, specifications oversight, and construction support services. Josif has been with Hoyle, Tanner for over 14 years, and has worked on more than 15 covered bridge projects. ACEC is the oldest and largest business association of engineering companies. Each year over 60 firms submit projects and are judged based on the complexity, innovation and value to society.